RICHMOND, Calif. (KGO) -- Some Contra Costa County workers weren't at their desks today, because they were out on strike. ABC7 News was in Richmond where a picket line went up Friday morning. More than 1,100 county social workers are off the job. 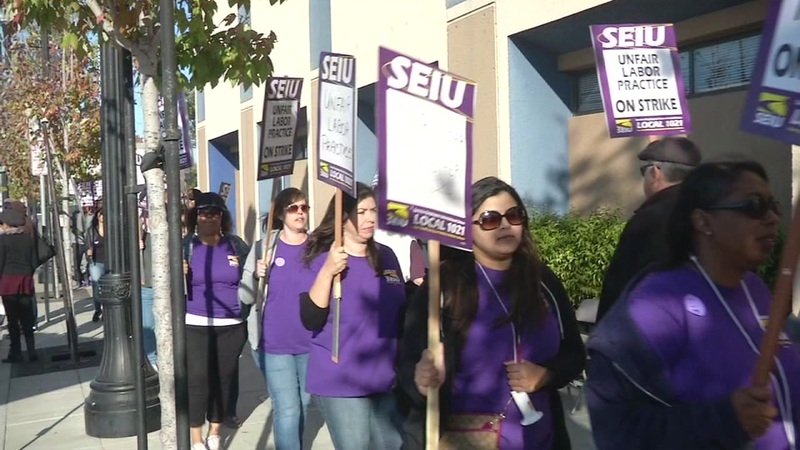 The SEIU members say they don't have enough co-workers to handle those who need help. They also claim $21 million in state and federal dollars have been lost because the county has not fully staffed the department. "Because we're not competitive, you know, we do have employees that look elsewhere for employment opportunities and we're losing very good people that really care about this community," said Champagne Brown, a social service worker. Those workers help the disabled, elderly and families seeking public assistance. The county sent ABC7 News a statement saying it hopes to continue bargaining with the union and says many of the workers out picketing were already scheduled to be off Friday.